Discover the stories behind the disruptive start-ups movement, as Lulu Laidlaw-Smith presents the companies who decided to Rip It Up, Start Again. Join us for April's event at Runway East, Moorgate. Led by Lulu Laidlaw-Smith, these dynamic innovators will take our guests through their experiences in the world of disruption, sharing the stories and insights they have gained. Nicholas has held senior global positions on 3 continents and his experience spans strategic & commercial innovation for international agency groups (WPP), Fortune 50 companies (Ford Motor Co.) and start-ups; building products and services that are designed to empower consumers and in doing so, create a meaningful narrative between technology, brands and people. people.io – a European start-up that is giving people ownership of their data. Backed by Wayra (Telefonica Open Future_) and Founders Factory (Brent Hoberman, Henry Lane-Fox, Guardian Media Group), Nicholas has also been recognised as the Nasdaq Rising Star 2016 for his work on the creation of a ‘firewall for people’. 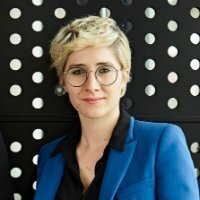 Learner, maker, systems thinker, innovator and tech evangelist, Luciana heads new business & partnerships for REWIND - an international award winning virtual reality, digital & physical production studio - and is co-founder of Unfold Inclusion, a social enterprise powering women/diversity in XR in the UK. Passionate about VR/AR/tech for good, she carries ongoing research on the possibilities and challenges immersive tech presents as re neuroscience, empathy and female empowerment. She is a STEM ambassador and member of Code First Girls, SheWorx, Ada’s List, Founders of the Future, Women of Wearables, Women Who Code, Blooming Founders, among others. She is also a Director and Evangelist at Realities Centre London, an incubator and academy for B2B VR/AR/MR innovation, and co-chairs the VRAR sub-group of Tech London Advocates. A new way to find talent using the power of community. By using this platform, clients have access to a curated and diverse network of experts who personally recommend people for roles. No daily margin, no % fee, no candidate ownership. Just a one off fee if you find who you’re looking for. Rip it up Start Again is live streamed from Runway East, Moorgate. Come and join us or watch live via YouTube. To submit questions to our speakers tweet to @RipItUpTheEvent.